Korean Children’s Union Foundation Day is a North Korean public holiday celebrated on June 6. It is dedicated to a children’s organization that can be considered the North Korean counterpart of pioneer movement. On this day, new children usually get admitted to the ranks of the Union. In the 1920s, future supreme leader of North Korea Kim Il-sung began the formation of the Youth League, a youth organization of the national liberation movement of Korea. The League was officially inaugurated on January 17, 1946, following Korea’s liberation from Japanese colonial rule. 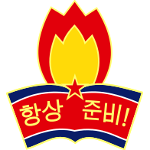 Originally named the Democratic Youth League of North Korea, it is now known as the Kimilsungist-Kimjongilist Youth League. Six months later (on June 6, 1946) Kim Il-sung founded the Korean Children’s Union designed to prepare children for joining the League. Both organizations are subordinate to the ruling Workers’ Party of Korea. Children are admitted to the Union at the age of 9 or 10 (the 2nd grade of elementary school). They begin attending regular meetings where they are taught about the Juche ideology and the Songun policy, the biographies of Kim Il-sung and Kim Jong-il, and other things that are considered ideologically relevant. At age 15, Korean teenagers join the Youth League. Children are admitted to the Korean Children’s Union on important public holidays such as the Day of the Sun (Kim Il-sung’s birthday), Korean People’s Army Foundation Day, National Day, or, since recently, Korean Children’s Union Foundation Day. Joining the Union is considered an important event in children’s lives.